Whisk together marinade ingredients in a small bowl. Pierce chicken breasts a few times, all over, and place in a large shallow bowl. Pour marinade over them, cover, and refrigerate for at least 30 minutes. Note: the flavor will be more apparent and the chicken will be more tender the longer you let the juices soak in- up to 12 hours. Whisk the stir fry sauce ingredients together in a small bowl, cover, and refrigerate for at least 30 minutes. Heat oil in a large frying pan set over medium-high heat. Remove chicken from the marinade and discard the remaining sauce left in the bowl. Add chicken to the hot pan and stir fry for about 7 minutes, until the chicken is browned and cooked through. Remove to a plate. Add the vegetables to the same pan and saute for about 5-6 minutes, stirring frequently, until they have begun to soften. Add the chicken back to the pan of vegetables along with the stir fry sauce. Allow mixture to simmer for 10 minutes for proper flavor infusion. In a small bowl, mix the cornstarch with 2 tsp cold water to dissolve. Stir into the pan and allow the sauce to thicken for 2 minutes or so. It should become a luscious, shiny glaze over the chicken and veggies. Garnish with orange slices. Serve. A wildly flavorful stir fry. 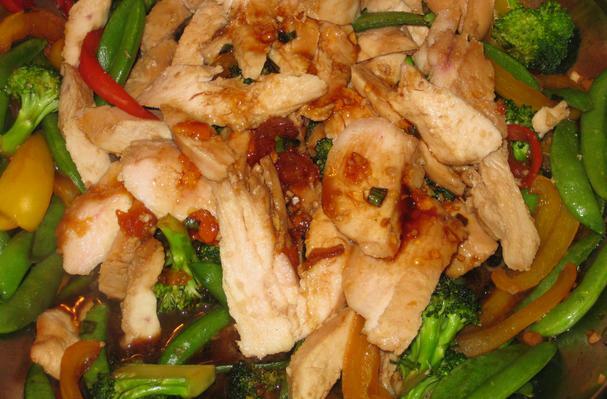 Tender, marinated chicken breasts with bell peppers, broccoli florets, and sugar snap peas, glazed in a zesty soy-apricot sauce. Served with steamed rice. This sauce is dynamite. Strong notes of salty soy sauce, spicy ginger, fresh squeezed orange juice, sweet apricot, and garlic. The difficulty with at-home stir fries is finding the perfect balance between salty and sweet. Soy can be overpowering, so blending it with sweet citrus, apricot, and brown sugar mellows it perfectly.